In the previous couple of blogposts in this series (here's part 1, part 2 and part 3 for you), I have explained how I got into the Cycling Twitterverse, how I imported data from a mix of sources (CQ Ranking, TwitterExport, and a Python script talking to the Twitter API), and thereby constructed a really interesting graph around Cycling. 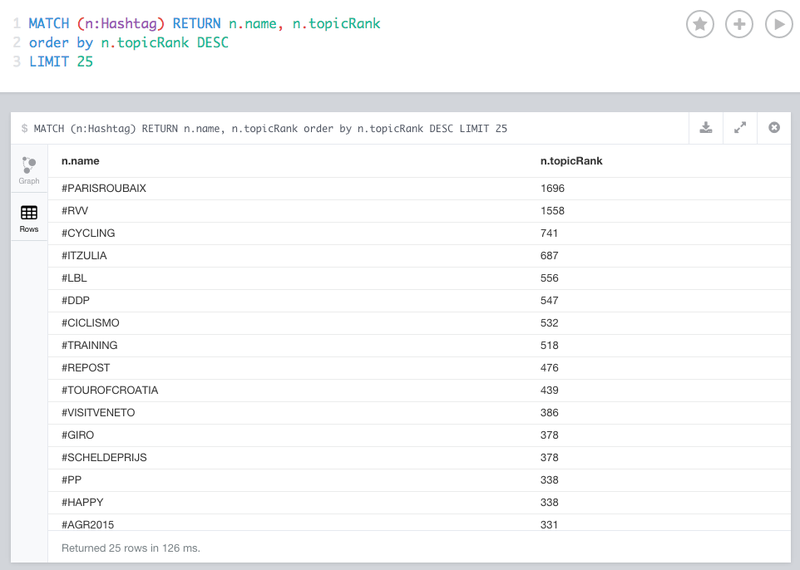 There's so many more things to do with this dataset. But in this post, I want to explore something that I have been wanting to experiment with for a while: The GraphAware Framework. Michal and his team have been doing some real cool stuff with us in the past couple of years, not in the least the creation of a couple of very nice add-ons/plugins to the Neo4j server. One of these modules is the "NodeRank" module. This implements the famous "PageRank" algorithm that made Google what it is today. 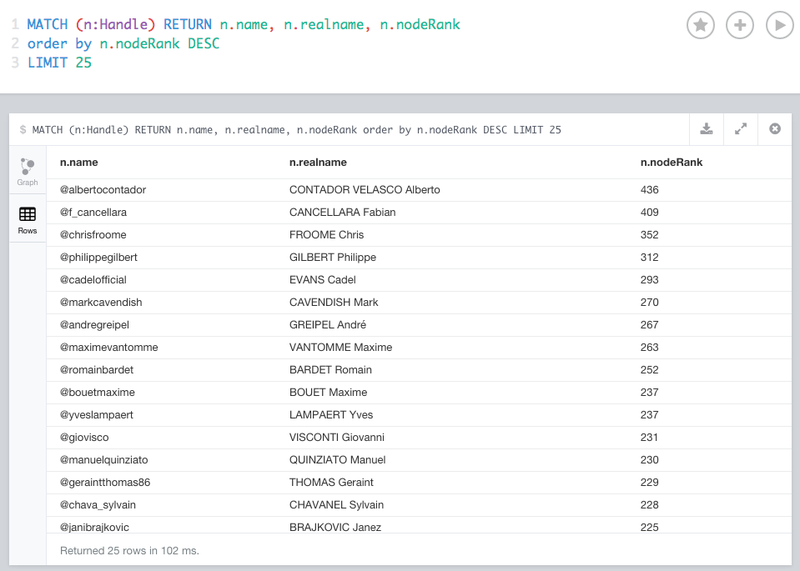 activate the runtimes in the Neo4j.properties file that you find in your Neo4j ./conf directory. #optional key of the property that gets written to the ranked nodes, default is "nodeRank"
As you can see from the above, I have two instances of the NodeRank module active. This seems to be confirming - in my humble opinion - some of the more successful riders in April, for sure. But also confirms that the "big names" (Contador, Froome, Cancellara) are attracting their share of Twitter activity no matter what. 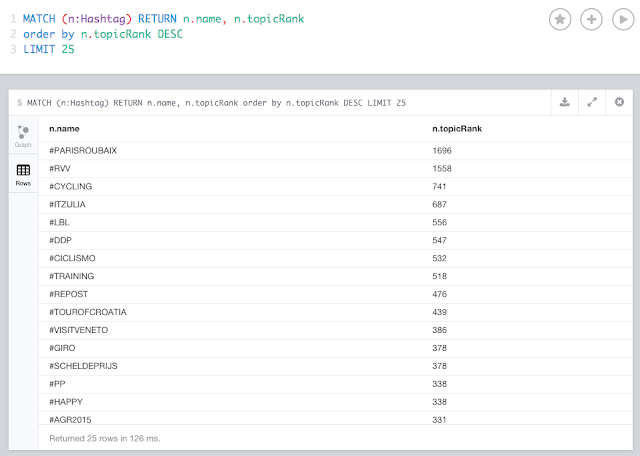 The second does the same for the "Topics" (in this case, the nodes with the label "Hashtag") along the the "MENTIONED_IN" relationships. The classic races are clearly "top of mind" in the Twitterverse! But upon investigation I have also found that there are a lot of confusing #hashtags out there that make it difficult to understand the really important ones. Would love to investigate a bit more there. 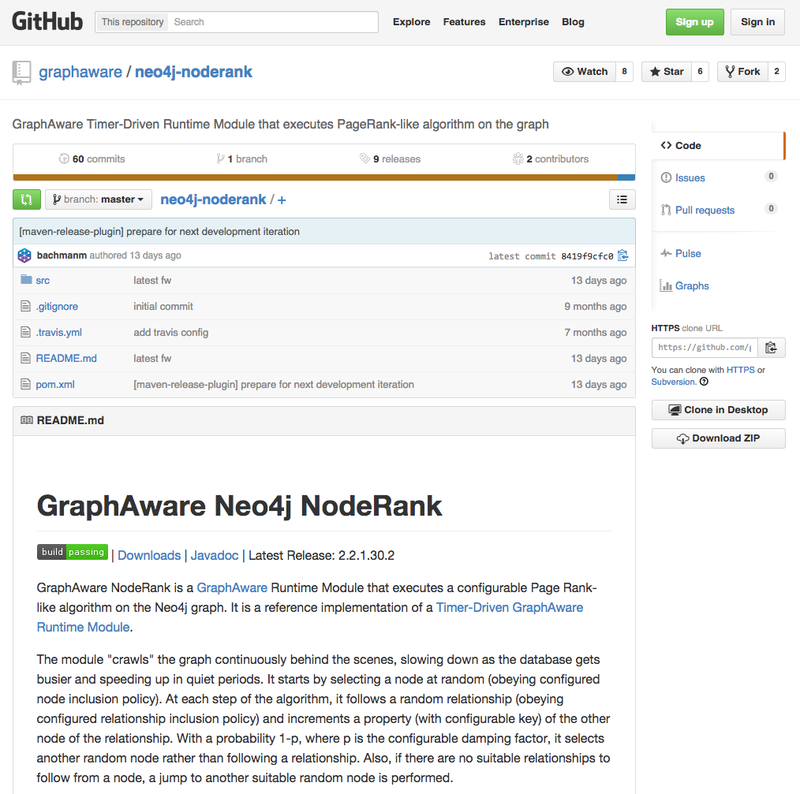 Like I said before, the GraphAware framework is really interesting. It gives you the opportunity to make stuff that you could also do in Cypher more easily, faster, and more consistently. I really liked my experience with it. Hope this was useful for you - as always feedback is very very welcome.